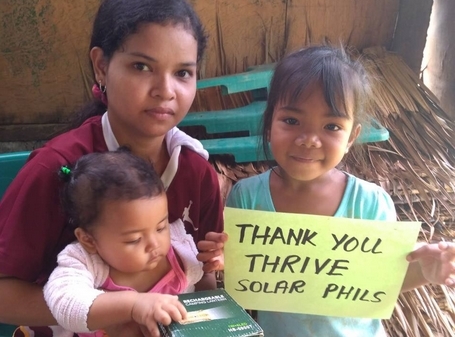 Thrive Solar Energy Philippines Inc. started 2019 continuing their social enterprise program with the Mangyan Community in Oriental Mindoro, encouraging the reading program for school children. Fil-Am community of Richmond, Virginia in partnership with Thrive Solar Energy Philippines, Inc. donated solar lanterns for two projects. The donations were made to Jeepney of Hope (mobile library) in Mindoro & Dagdag Dunong Reading Center Manila through Professor Anna Marie Bacudio, project leader for both NGOs. The end beneficiaries were Jose Odasco National High School and Sta Cruz Elementary School, both located in Baco, Oriental Mindoro, to the children of the Mangyan community. Adong Mangyan School is the next beneficiary.